In a universe this incredibly vast, we can be sure we’re not alone. It’s almost beyond doubt that alien life is out there. It’s even possible that little gray men have paid us the odd visit. Just like David Duchovny in the 1990s, many of us want to believe. But that belief can take us down routes that are, shall we say, less than scientific. And while it might be exciting to believe those strange lights buzzing your house last night were UFOs, the truth is probably a lot simpler. 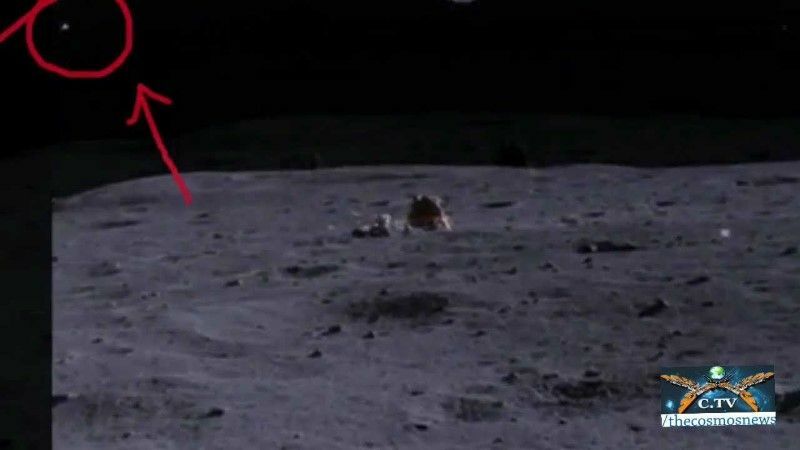 The Apollo 16 UFO tape was a six-second bit of footage that seemed to prove UFOs were visiting our moon. Shot on a jerky, hand-held camera, the film shows what looks eerily like Hollywood’s idea of a flying saucer hovering near the lunar module. Today, it’s trumpeted by sections of the UFO community as a verified sighting, despite NASA debunking it years ago. When experts extracted still frames from the footage for analysis, they realized that the UFO appeared to have a metal pole protruding from it, one almost as big as the ship itself. Seen at normal speed, the pole was hidden in shadow, but on the still image, it was clear as day. And it appeared to be attached to the lunar module. The UFO was nothing more than the module’s own external floodlight, with a few dramatic shadows conspiring to make it look mysterious. The only aliens the footage showed visiting the moon were, well, us. Early in 2014, a video was uploaded to YouTube from the Asadabad district of Afghanistan. Filmed by Marines, it appeared to show a floating, triangular object attacking a Taliban camp with some sort of impossible space weapon. Across the world, people went wild. The Daily Mail ran a serious analysis claiming the object could be from another world. The Huffington Postcouldn’t decide if it was a UFO or a new type of super-drone. Was this final proof of alien existence? You can probably guess the answer. Instead of a UFO or even a drone, the object turned out to be a CGI light show designed by YouTube user Section 51. At some point, he or she had found a genuine video of a Joint Direct Attack Munition (JDAM) destroying a bomb factory in the Middle East and decided it needed more aliens. Even as news sites were taking the video at face value, online conspiracy factory Infowars was actually debunking it. We’ve told you before about the ancient astronaut theory—the idea that aliens visiting Earth in the distant past were mistaken for gods. The theory has been popular ever since Erich von Daniken published his 1968 bookChariots of the Gods, capturing the public imagination with a tale so incredible it could have been written by a master storyteller. And guess what? It was. According to a 2004 report in Skeptic magazine, all the main ingredients of von Daniken’s book were invented by H.P. Lovecraft. Way back in 1921, Lovecraft penned his most famous story: The Call of Cthulhu. Featuring a hideous alien nightmare that comes to Earth in the distant past and is worshipped as a god, it sparked a craze among other pulp writers for inserting the character into their works. This cycle of alien-god stories became known as the Cthulhu Mythos. It was incredibly popular in France, where the editors of Planete magazine used it as basis for their bookMorning of the Magicians, an allegedly non-fiction account of ancient aliens coming to Earth and being mistaken for gods. Von Daniken used this book as his major reference when writing his 1968 best seller. The major jump-off point for the ancient astronaut theory wasn’t scientific or archaeological analysis but a collection of horror stories written only decades beforehand. The Kelly–Kentucky incident is one of the most infamous in UFO lore. One night in 1955, a farmhouse in backwoods Kentucky found itself under siege by malevolent goblin creatures. Standing 100 centimeters tall (3’6″) with gigantic heads, pointed ears, and glowing eyes, the goblins surrounded the house—before retreating when the farmers unloaded at them with the sort of firepower only Kentucky rednecks can pack. Eventually, the inhabitants fled the farmhouse, convinced they’d witnessed an alien invasion. In 2006, Skeptical Inquirer published an article that blew the theory out of the water. Aside from noting that the farmers in question were most likely drunk and that at least one of the witnesses was a publicity seeker, the article covered the existence of a real-life goblin-like creature in the area. It was a creature with a gigantic head, pointed ears, and eyes that can seem to glow at night—a creature known as the great horned owl. Instead of shooting aliens, the farmers had been blasting away at nothing more terrifying than a particularly territorial group of birds. In 2009, UK tabloid The Sun printed a story so incredible it made the world sit up and take notice. After a night in which strange lights were seen in the sky, residents of Lincolnshire awoke to find a 90-meter (300 ft) wind turbine had been smashed to pieces in the night, exactly as if a flying object had crashed into it at high velocity. For days, the story of the Lincolnshire UFO gripped the papers until it became apparent that there was a far more earthly explanation. Ever since the early days of space flight, NASA has made a point of giving their astronauts video cameras. Over the decades, thousands of hours of awesome space footage have accumulated, large chunks of which apparently contain UFOs. Known as NASA’s mysterious lights, the videos show strange lights orbiting various NASA craft in low Earth orbit. As an added slice of surrealism, the astronauts talk about them as if nothing weird is going on at all. For many, this is proof that aliens are in such regular contact with the US government that insiders have ceased to find them anything but ordinary. At least, that’s the theory. According to the astronauts themselves, they act like these lights are normal because they are. In one famous case, the object UFO-ologists got excited about turned out to be nothing more than agovernment satellite catching the sunlight at an odd angle. Other lights were ice crystals propelled into space by a shuttle’s thrusters or even a distant star. Thanks to media such as The X-Files, the most widely known type of aliens are The Grays. These creatures were first recorded way back in 1964 by supposed abductee Barney Hill. Under hypnosis, Hill recounted meeting a group of Grays during a journey in 1961, many years before pop culture would ever get wind of them. Since then, UFO-ologists have claimed his abduction as one of history’s first genuine encounters. Rather than an encounter with extra-terrestrials, it seems that Barney’s subconscious was simply replaying fragments of whatever he’d been watching in the weeks before he was hypnotized. In 1561, the residents of Nuremberg awoke to an unusual sight. In the sky above the town, strange balls and rods the color of blood appeared to be battling it out, shooting each other out of the sky. The event was recorded by Hans Glaser in an infamous woodcut, which looks more or less exactly how you’d imagine a medieval space battle to look. Surely this is excellent evidence for alien visitation, right? Nope. Woodcuts are very different from photographs. Rather than reporting the world as it was, they usually spiced things up with religious references or nods to the supernatural. In another of his woodcuts, Glaser drew medieval knights having a meeting in the sky, while other examples of the genre include things like glowing crosses, angry gods, and celestial bodies with grinning faces. If you ignore the picture and focus only on the text of the woodcut, the battle sounds very much like someone describing a sun dog—a weird light effect caused by ice crystals reflecting the Sun in the upper atmosphere. Glaser simply added a bit more action, presumably in the hopes of selling a few more woodcuts. During the dark days of World War II, pilots going on bombing runs over Europe reported seeing strange glowing balls streaking through the skies. Christened “foo fighters,” the objects were initially assumed to be a strange new Nazi weapon. Fast-forward to the present day, however, and they’re now considered to be one of the biggest mass UFO sightings in history. On the other hand, they could be something infinitely more mundane. Ball lightning is a form a lightning that, as you might expect, appears as a small, glowing ball. It has previously been recorded on the wings of planes moving in excess of 400 kilometers (250 mi) per hour and moving back and forth across the sky at bizarre altitudes. It’s nearly a perfect match for descriptions of foo fighters from World War II. In 1952, Washington, D.C. became the only American city in history to be invaded by an alien fleet. On July 19, city air traffic controllers noticed a cluster of weird blips on their radar screens. When they contacted nearby planes to ask if they had seen anything unusual, one pilot responded that he’d seen six bright lights “streaking across the sky.” But this was only the beginning. When the weird blips returned a week later, jets scrambled to intercept. The pilots reported glowing lights that flew away from them. The encounter made all the papers. After all, what could possibly jam up radar screens and escape from pilots except real UFOs? How about temperature inversions? A layer of cold air trapped under a layer of warm air, temperature inversions are capable of some weird things—including turning up on radar screens. They can also create illusions, especially if there’s a handy layer of moisture trapped there to reflect ground lights back at unsuspecting pilots. And the conditions in Washington that summer just happened to be perfect for moisture-loaded temperature inversions. Sorry, believers.